Duncan Jones knows how to craft a sci-fi thriller. He showed us that much with his directorial debut of 'Moon.' Now he's moved on to a bigger budget and a wider release with 'Source Code,' but he stays true to himself and his craft. 'Source Code' is a simple, but at the same time complex story about a young soldier named Colter Stephens (Jake Gyllenhaal) – sporting the requisite three-day action hero stubble - who has been put in some kind of capsule that allows him to relive the same eight minutes over and over right before a bomb goes off on a crowded train headed into Chicago. This new technology is called The Source Code. Dr. Rutledge (Jeffrey Wright) is there to expound upon where the technology came from and what its purpose is. Stephens has a friend in Colleen Goodwin (Vera Farmiga) who directs him through his mission trying to find out what he knows and instructs him on what he needs to find out. It might all sound a little confusing, and that's because it is -- at first. We're as lost as Stephens is the first time he wakes up on a train not knowing how he got there. Sitting across from him is the beautiful Christina (Michelle Monaghan) who thinks Stephens is actually someone named Sean Fentress. Like 'Groundhogs Day,' Stephens relives these same eight minutes continually, trying to find the bomb and who planted it there. He's got to do it fast, because in the real world millions of people may die since the bomber has threatened to set off a dirty bomb in the middle of Chicago. 'Source Code' is an inventive thriller, because at its core it really is a simple story. It's a movie that proves that formula isn't always a bad thing. It's a given that Stephens is going to fall for the beautiful girl, even though he has no idea who she is. Those eight minutes begin to add up and Stephens finds himself wanting to save Christina, even though it's impossible because we're told all The Source Code is, is a computer program. There are plot points that I dare not talk about, because like 'Moon', 'Source Code' has its own twists and turns that it thrusts upon us in the last 30 minutes. Suffice it to say, Duncan Jones has created another sci-fi thriller that not only engages us on an intellectual level, but also on a personal level. We are just as much in the dark as Stephens is. We only find out what he finds out, and then there's that moment where everything clicks, and it all makes sense. Thinking back on the movie I can't recall any gaping plot holes or any missed opportunities. Jones shows that you can make a thrilling action movie that doesn't just rely on car chases, gun fights, and explosions. Don't get me wrong, 'Source Code' has its fair share of explosions (I lost count of how many times we watched that train blow up), but it doesn't rely on them to make the movie exciting. This is a psychological thriller -- a movie meant to tease your brain. It's nice to watch an action movie where you don't have to give the excuse, "Well, just shut off your brain and you'll enjoy it." You're going to need your mind during 'Source Code.' It will test it and test you. If I didn't know any better I'd say 'Source Code' was written by Rod Serling's ghost. It has such a deep 'Twilight Zone' feel to it that it's hard to shake the similarities. Jones, and writer Ben Ripley, have – either knowingly or unknowingly – created one of the best 'Twilight Zone' homages I've ever seen. 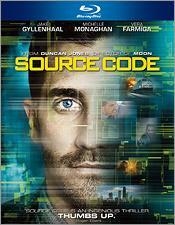 This release of 'Source Code' from Summit Entertainment is emblazoned with the moniker "Special Release." Aside from maybe the snazzy slipcover – which has different artwork on the back than the case does – I can't see anything that would make this one especially special. There's no DVD copy. No Digital Copy. Just a BD-50 Dual Layer disc inside a standard Blu-ray keepcase. Summit's 1080p AVC-encoded transfer of 'Source Code' is a glistening, detailed video presentation that you won't soon forget. When the movie opens on a close-up of Gyllenhaal's face you'll notice right away the amount of clearly defined detail that's in store here. Pores are clearly visible, as is every piece of hero-stubble adorning his face. From the opening shot it never lets up. Textures are rich and revealing. Fabrics are easily distinguishable from Christina's black and white weaved overcoat to the pressed blue of Goodwin's military uniform. Blacks are often perfectly bottomless, but there are a few scenes where they seem to be a bit overbearing. The biggest complaint I had with this transfer is that skintones seem to burn a little too hot as they take on a more reddish hue. Other than that minor nitpick I didn't find any technical anomalies. There was a hint of aliasing right near the end on a skyscraper, but that may be the way it was being filmed and nothing to do with the technical proficiency of the disc (you'll see what I mean). All in all, 'Source Code' is a near demo-worthy disc that you'll be proud to pop in whenever you want to show off your TV's capabilities. The first thing you'll notice when the movie opens is Chris Bacon's lively, and somewhat Hitchcockian score that floats through the soundfield. The music immediately draws you into the movie and sets a perfect mood for the mind-bending thriller you're about to watch. LFE is a common occurrence seeing that there's a giant train explosion every eight minutes or so. The low-end frequency booms and shakes the room whenever it's called upon to do so. The mix isn't just proficient at delivering the same old action sounds either. More nuanced sounds are prioritized perfectly; like a spill of coffee, the pfft of a soda can opening, or the clicking of a train ticket being punched. Sound effects are given room to breathe here. The soundfield engulfs you whenever Stephens is sucked back into The Source Code with a whoosh sound that fills the entire room. Making it feel like you're being sucked through right along with him. Even though the DTS-HD Master Audio 5.1 surround sound track features much of the same type of sounds you expect to hear in an action movie, it does give credence to more understated sounds by bringing them to the forefront and creating a sometimes confusing atmosphere, which is exactly what the movie intends. Audio Commentary — Here Jones is joined by Ripley and Gylenhaal for a discussion about the movie, its filming and its characters. The three of them talk extensively about how they planned and executed the final product. They discuss the difficulties about creating a layered science fiction tale like this. 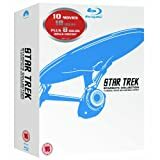 It's a fairly standard audio commentary, but the three of them are congenial enough and it serves as a nice companion piece to the film, helping people learn a bit more about how it was put together. 'Source Code' is expertly crafted and executed. It's a proficient thriller that packs in its complicated tale into a brisk 94 minutes. It doesn't require you to shut off your brain to enjoy it, either. This is a thinking man's thriller full of action, suspense, and smart science fiction. What more could you ask for? The special features are a little thin, but the audio and video presentations are spot-on. 'Source Code' comes highly recommended.